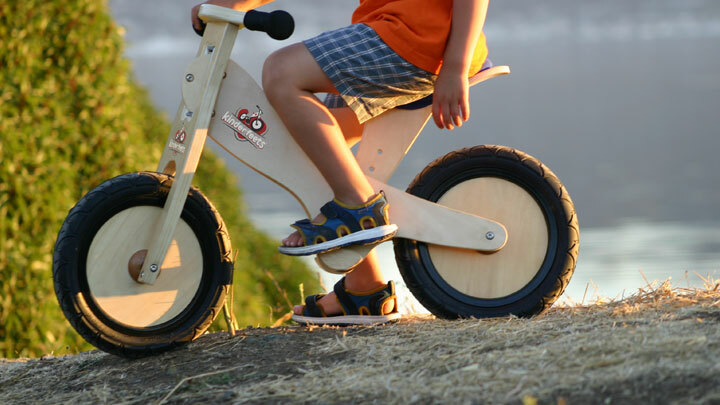 Q: How do you use the Kinderfeets balance bike? A: Learning to ride is very intuitive. Sitting on the Kinderfeets, kids first walk the bike forward. As they go faster, they stride with feet off the ground for longer periods of time, ultimately being able to pull both feet off the ground and coast with their feet on the footrests. At first they tilt to one side or the other and their feet catch them like training wheels. Very quickly, balance becomes second nature and they can coast with their feet on the pedals. Braking is done by putting both feet down to stop. 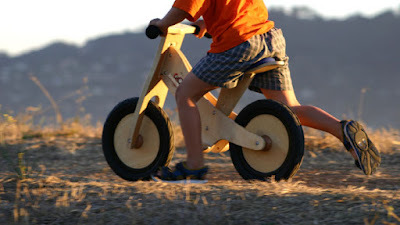 Q: How old does a child have to be to ride a balance bike? A: Although different brands and designs may vary, Kinderfeets is designed for children between the ages of 2 and 5, or as soon as they can reach the ground while sitting on the lowest seat position. The seat can be adjusted so that the bike grows with your child. A: Most children are able to walk/ride the first time they sit down. They will be able to coast with their feet on the pedals after a week or two. Each child learns at his/her own pace. You are always welcome to come in to the store and let your child try a Kinderfeet bike out and have a closer look.